Home > Recipes > 10-15 minutes recipes > Sweet Stuff > Strawberry chocolate love! Looking for an easy and delicious Valentine’s Day dessert? In this recipe you just have to melt dark chocolate and dip strawberries (or other fruit) in it. Fruit and chocolate are a divine combination. Celebrate love with this romantic easy-to-share dessert. Dark chocolate (min 70%) is rich in antioxidants, can be good for the heart, strengthens the immune system and is associated with longevity. Break the chocolate in pieces and melt ‘au bain marie’ (in a metal or heat resistant glass bowl over simmering water, make sure the water does not touch the bowl). Frequently stir the melting chocolate. 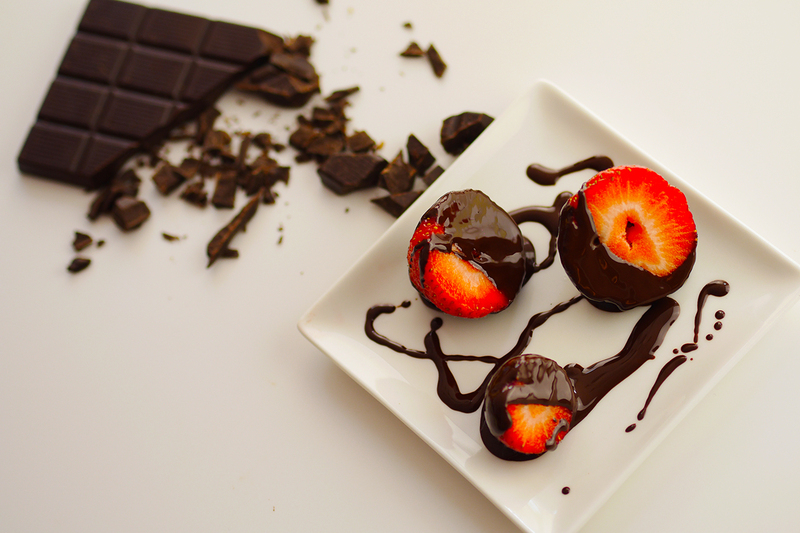 Dip the strawberries (or other fruit) in the melted chocolate and eat straight away.